Fairytale-themed slots litter the online casino world like an overflowing dustbin just after Christmas, and chances are if you close your eyes and pick a slot at random at your friendly local slots casino you’ll find one filled with winged beauties, magic, evil witches and spells. 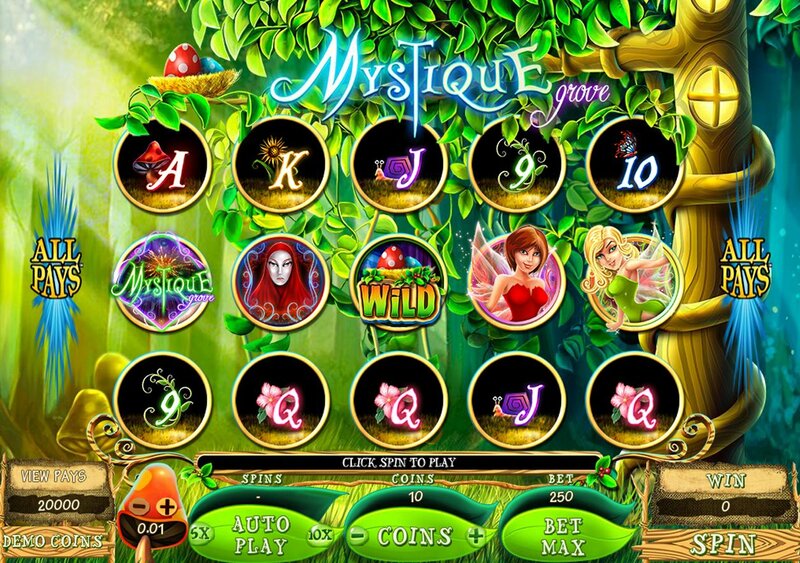 Luckily, then, globally recognized developer Microgaming have added to the bulging sack marked ‘Grimm’s fairytales’ with Mystique Grove, a 5 reel online slot that offers a neat little bonus and the developer’s customary 243-ways-to-win betting system. This means there are plenty of opportunities for players to win some prizes. That doe not necessarily guarantee a great slot though. On the reels, as well as the winged fairy and her pal, we get a seriously pissed-off looking evil Queen, an owl, plus plenty of mystic-looking 9-through-Ace symbols. The mushroom symbol in the game is the Wild, and this magical icon substitutes for all symbols in the game other than the Scatters. 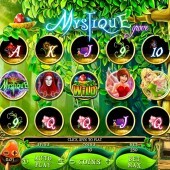 The “Mystique Grove” logo, meanwhile, is the game’s Scatter, three or more of which trigger the Mystique Grove Bonus. In this fairly straightforward bonus feature, 15 flowers will appear on-screen. Essentially it’s a Pick ‘em Bonus round where you’ll get to choose from the various flowers in order to reveal a prize. Once you hit ‘Collect’ your game is over and you’ll be returned to the main screen. Unfortunately, that’s your lot for bonus rounds here, and personally I would have liked to have seen more from a modern slot considering it’s come from the Microgaming stable. And as you’re playing the 243-ways system in Mystique Grove, it does pale in comparison to the developer’s other 243-ways games like the big movie tie-in, Lord of the Rings, with its multitude of bonus rounds, or the space-themed Galacticons with its mega jackpots; both of those top online slots games should be on your radar if you’re into big-betting action.